Providing you the best range of potato powder with effective & timely delivery. 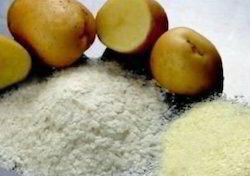 We offer Potato Powder which is produced from selected ground potatoes. It finds extensive use in baking applications for thickening purposes as well as adding flavor & texture to items like breads, confectionery items and use in soups and gravies. Helping in enhancing texture of finished dish, it changes the taste and consistency of the food recipes requiring use of mashed potatoes. Further, the use of moisture proof packaging also makes it have a long shelf life.